Update: below, pension funds are mentioned as new macro economic players. Just read in the newspaper (29/3/2014) that the European commission wants these funds to make/finance more real investments instead of just buying Bunds or stocks. The consequence will of course be that they, once, will own a very large chunk of our economy and infra structure. “as I wrote long ago, in a piece from the 1990s, IS-LM is basic economics applied to a world in which in addition to production of goods there is both money and a bond market“. A) Not all bond markets are equal. In the USA, non-financial companies use a lot of bonds to finance their investments. In the Eurozone it’s different. The market for company bonds is limited (though Mario Draghi suggests in a highly relevant speech that it is growing) and non-financial companies finance their investments by borrowing from banks. And while bond markets are typically and consistent with one of the assumptions of the model a ‘loanable funds’ market, banks can finance lending by money creation. Which means that, in the Eurozone, the amount of money increases when companies start to invest and to borrow more while, in the USA, to the contrary interest rates on the bond market will tend to increase. European Banks also seem to have some increasing non performing loan problems, which wreak havoc with any kind of IS-LM model. B) The topsy-turvy world of derivatives. It is becoming increasingly clear that the number of small and medium-sized enterprises which were sold ‘derivatives’ by the banks is larger than we thought. See for instance this path breaking article, published today, about the Netherlands (in Dutch). As far as I know the situation in the UK is not much different. Which means that lower interest rates lead to higher costs, for many companies in the Netherlands as well as the UK. C) Pension saving goes up or pensions go down up when the interest rate goes down. Pension funds are becoming ever larger and ever more important as macro-economic players. When interest rates go down these pension funds are pushed by, among others, the central bank which lower these rates to either increase the mandatory pension saving rates or to slash pensions. Higher savings would not be too bad if these savings were invested in the real economy by lending them to companies via a bond market or by financing building projects. But that does not happen. The additional funds are stacked away and used to buy government bonds, pushing interest rates even lower and, just like lower pensions, depressing the real economy. The ‘paradox of thrift’ in top gear. D) The model does not take account of asset price related booms and busts Construction is one of the more cyclically sensitive sectors. 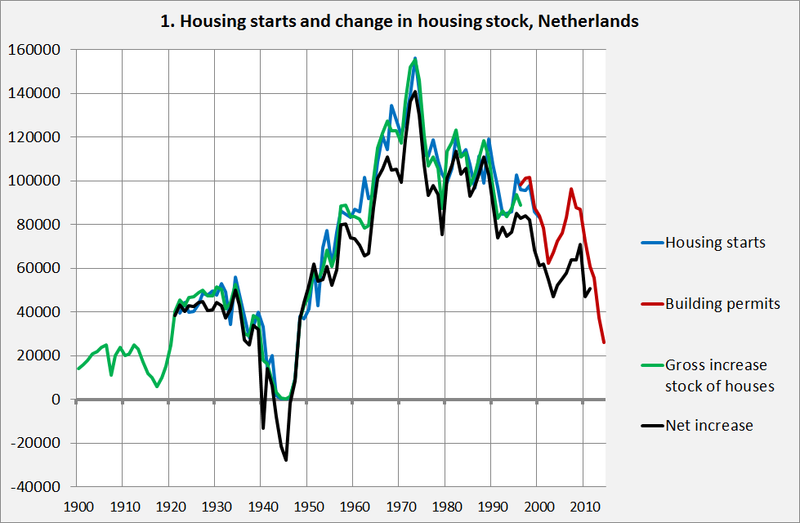 But this downturn is not your typical post WW II cyclical dip – construction in the Netherlands is even down to a pre-war level (pre WW I, that is…). See graph 1. Aside 1: between 1900 and 2014 the population of the Netherlands increased from 5 to 17 millions. Aside 2: the difference between the black and the red line is real: slash and rebuild is a national pastime, in the Netherlands. The flabbergasting decline is due to a number of causes (I’ll have to go into some detail to prove my point). 1) Banks are hesitant to lend and households are hesitant to borrow because of historically high mortgage debts, which were cause by (and caused) a house price boom. 2) Pension funds (the Netherlands have, in a relative sense, the largest pension funds of the world) do not step in because they are weary of real investments and prefer ‘safe assets’. 3) Derivatives led (on top of the problems mentioned above!) to severe losses of some the ‘housing corporations’ (here a very good english article about this by Ernst Labruyere), a problem which is not solved by suing the banksters which sold these derivatives but by, in effect, taxing the other corporations to cover the losses, a financial blow which comes on top of 4) additional new taxes for these corporations (taxes which are, in the end, of course paid by the renters). The corporations are of course reacting to this situation by decreasing cash expenses, i.e. postponing investments in new houses. 5) The government slowly decreases the maximum ‘loan to value’ ratio of new mortgages (which is still over 100%, by the way) which puts pressure on house prices and, i.e., on new construction projects as people need time to adjust their balance sheets to this new situation. Also, 6) some municipalities were slow to decrease the price of building plots. At the same time, experts state that quite some new houses are still needed! The point: all kind of institutional and historical changes prevent an upswing of building, despite low-interest rates and exceptionally large amounts of available savings. E) The monetary transmission channel does not work, in the Eurozone. Despite the best efforts of the ECB, interest rates in the ‘periphery’ are, though possibly coming down, still high. Read Draghi (see the link above). F) The drive for (much) lower nominal wages of course does not help. Greece is, at this moment, in a situation of outright and vicious debt deflation caused by a 20 to 25% decrease of nominal wages in combination with a severe decline in the stock of money. IS-LM does not really take account of such situations. Again, I kind of like the IS-LM model. But when you use it to analyse the Eurozone you have to take account of this kind of ‘operational detail’: interest policies are of limited use. In the Eurozone, IS-LM tells us that more direct purchasing power creating central bank policies are needed, like directly lending to non-financial companies by central banks or buying non-performing loans.